Help the Des Moines Rehabbers Club win a $1000 Grant! 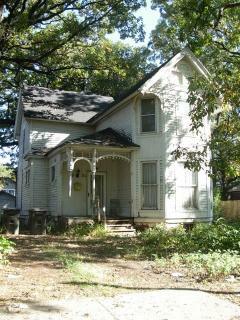 Victorian Home in Danger of Demolition: This home is on the City's "Public Nuisance" list and may be demolished if deficiencies are not corrected in a timely manner.The Des Moines Rehabbers Club is a loose affiliation of people with a common interest in renovation, preservation, and maintenance of Des Moines' historic buildings. The group is in the running for a $1000 grant through the "Dream Big Grow Here" project of MyEntre.net. MyEntre.net is an entrepreneurship development system consisting of an online social network and free web-based entrepreneurial resources, coupled with collaboratively driven services and capital for entrepreneurs in Iowa. Send an email to steve@renovatedsm.com to be included on a daily reminder list. The Des Moines Rehabbers Club will use the grant to incorporate as a sustainable organization, sponsor additional events throughout the year, and hopefully send two (or more if there is enough left) members to Lead-Safe Work Practices trainings.